“Seriously? You’re telling me you believe that a man rose from the dead? You actually believe that?” Have you ever had a friend ask you a question like this and you’re not sure how to answer? 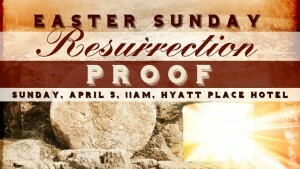 Or have you yourself ever wondered if Jesus’ resurrection ever actually happened? Have you ever thought, “Where’s the proof for the resurrection?” Did you know there were those in the Bible who doubted the resurrection? One of Jesus’ own followers Thomas doubted the resurrection. Thomas asked for proof of the resurrection. He doubted until Jesus showed him his nail-scarred hands. This Easter Sunday you’re invited to touch the nail scarred hands of Jesus, so to speak. It’s my hope you’ll come away from the message more solidified in your faith and knowing how to lovingly answer those who doubt the resurrection. This is a great Sunday to invite your friends who might be wondering about the faith. It’s my hope we’ll all leave the day saying what Thomas said upon touching the nail scarred hands, “My Lord and My God!” Come celebrate with us this Sunday, 11am, at Hyatt Place Hotel in Grandview Yard.